I've talked about the acting methodology for Ghost Little's universal story structure. It borrows from how Pixar builds its movie plots, with a few modifications. That's how everything clicks at a high altitude for the story. 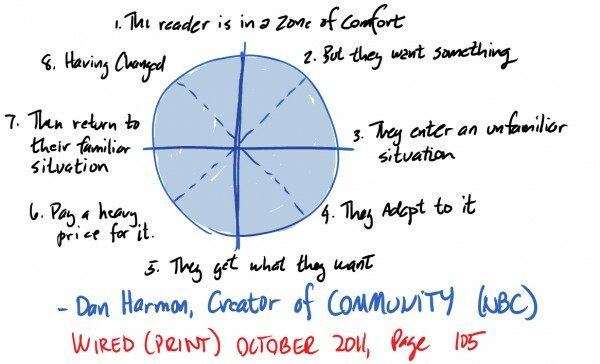 Lower down though, I've implemented something else: the Dan Harmon Story Circle. Each chapter in each book begins with an outline governed by a story circle. It's worked to great effect, in particular with introductory chapters, which are self-contained stories by design, as well as each book's starting point. I'm also using this tool to elevate the offer of free books to invite new readers into the story-sphere. However, just as I'm working on a modified Pixar story structure, I want to see if there's anywhere Harmon's story circle should be changed. Each outline begins with numbering out the eight joints in the circle. You'll see the diagram above. Here's our exercise: I'm suspicious this structure, while functional, is too bound to the sitcom format that Harmon works in. Also, I think he might have created it partially as a joke. I say "partially" because you can see the method very much alive and walking around in something as recent as Rick & Morty. Does the structure work-as is? Or should I modify it? no. 1: COMFORT is a great place to begin. It presents the character at ease. Things are normal. We're reminded what normal looks like. I position this as the welcome-mat in all the free books. Sometimes I have this as a lengthy introduction. Other times it's only a moment because the second point comes out of nowhere. no. 2: NEED arrives, demonstrating the character from before was not as satisifed as initially believed. We learn about their true wants. We learn about their wants upsetting their comfort. This is the driving force for either the remaineder of the chapter, or for half of the chapter. no. 3: The next joint, GO, is obvious. The character's need overrides their comfort and they need to take action to become satisfied. The reason for this GOing should be clear. Now we have a character, who we know in comfort, and in need, moving location. What will they find there? no. 4: They won't find anything until they SEARCH. This is the character against adversity. Perhaps they've arrived in the new location but have not discovered their objective as easily as they intended. They must dig into this new location. The location must reveal itself, otherwise, this need they felt wasn't all that big, and the story is weakened. no. 5: At last, they FIND the thing they wanted. Too many stories place the finding at the end. It's better in the middle. It's better for demonstrating what the character will do once they have the thing they need. If the character was painted properly, an audience might even have thoughts on how the character might react. That's fun. That's engagement. no. 6: TAKE. This is where things get tricky. By definition, the second action was NEED, as opposed to WANT, which is different. If there was a NEED, the character might go so far as to TAKE the thing by force. The friction of the word TAKE suggests either unrightful seizure, or perhaps the character had to strike a deal with the person in the new place they've come to. In any case, the item's discovery is not the end of the story. no. 7: The character is beset with REGRET. This meaans that perhaps their NEED wasn't so great after all. Or, perhaps the price to TAKE the thing was too great. The action is human and internal here, where the audience recalls what has taken place so far, adds it all up, and can judge along with the character if this was worthwhile. no. 8: At last, we RETURN. This is another tricky one. This is also the one I have the most concern over. A sitcom requires the characters return to the usual status-quo. A book is usually composed of chapters, usually in order, usually a continued story. RETURNing the character to their prior state at the end wounds the story. They could return, dejected, defeated, having learned a lesson. How does the grander story continue, with that in mind though? The answer is: it can. This structure is a magic trick that can be done in most story situations. I would say in 75% of the chapters in a book could work within this structure. For a major status quo shift though, the RETURN point has to be flexible, or replaced altogether. RETURN could be a return to COMFORT, if only for a moment. It could be a RETURN to an original location, emptyhanded, the REGRET getting the better of the character. That's a powerful development. Or it could be the character recognizing that they do not belong in this new location they originally had to GO to for satisfying a NEED, and they return to the wilds of where they began. The only instance RETURN couldn't be used is in a TO BE CONTINUED... or cliffhanger scenario. I'm not in love with cliffhangers or twists as a rule. The trip along the story with the character and the bait of there being another adventure in the following chapter should be incentive enough, if the job is done right. Interesting to think about, isn't it?